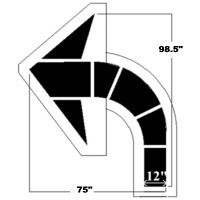 Curved Arrow Large Stencil Federal Specs 98.5" x 75"
CURVED ARROW Stencil 98.5" x 75"
Mark your parking lot or roads effectively with this curved arrow stencil to help direct people more effectively and help make bikers, pedestrians and drivers safer. Our Arrow Stencils are flexible 1/8" Plastic (125 mil) and can also keep your parking area, roads, streets, warehouses and other facilities attractive and clearly marked. Shipping: large, fragile or heavy products may be handled OFFLINE AND BILLED SEPARATELY (OR WE CAN USE YOUR FEDX or UPS ACCOUNT NUMBER).